Before I took an architectural photography workshop in LA last month I did not know this little gadget even existed. But one of my fellow photographers had one and I quickly added it to my “must have” list of photography gadgets. 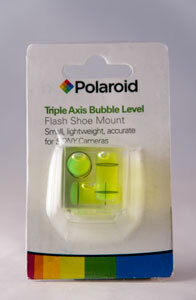 There are several varieties of hot shoe bubble levels available. Button, two axis and three axis are the most common. You can also find them from numerous manufactures and at numerous price points. On the high end they go can go for about $35 and all the way down to $6-7 for a low end one. These are great for architectural and landscape photography. They allow you that extra bit of confidence that your horizon or building is straight, saving post-processing time or worse a ruined photograph. There are a few pros and cons of the hot shoe bubble level of course. Lets get the cons out of the way first. As the name suggests, this device slips on to the hot shoe of your camera, where the flash goes. So obviously you cannot use this with a flash. It really is only useful for tripod photography, which most architectural and landscape photography is anyway. But as you can imagine, if you are looking through the view finder you can’t see the level on the top of the camera and if you move to see it you lose your composition. Beware of the cheap versions. That generally goes without saying for most anything. Although the one I bought works great, I have seen complaints that some of the low priced ones are not calibrated right and do not give accurate readings. Your photographs are probably worth investing a little more for the better quality. Pay attention to what you are buying. This may not impact most people. But for Sony Alpha users the hot shoe is the reverse configuration of most other camera brands, Canon and Nik0n. So when the description says “fits all standard SLR/DSLR hot shoes,” know that yours is not standard. 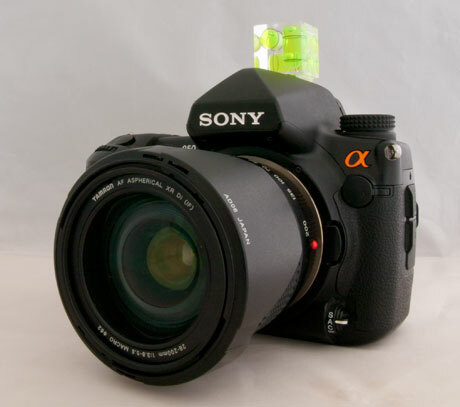 You need one made specifically for Sony Alpha. Level photographs nearly every time. This is such a simple little gadget but for those of us who have a hard time keeping that horizon straight this really does save a lot of post processing. Bottom line, it works (see #3 above of course). Go for the triple axis. I have not used the button type or a two axis variety, but for a few more dollars the versatility of the three axes (I looked it up, that is the plural of axis) is well wroth it. You can double and triple check your layout and make sure you are getting a level shot in all ways. It is also great for when you change your camera orientation from horizontal to vertical. I can only speak for the one I bought, the Polaroid Triple Axis Bubble Level , but this one is well constructed. The bubbles are truly level and the plastic housing is durable and well constructed. Again, only speaking for the one I bought, the price was great. I’m not sure what you might get for 3 times the price, but at $9.99 through Amazon this was a good deal. Overall, I definitely recommend getting one of these if you shoot architecture and/or landscapes. It is an inexpensive little gadget that gives a lot of value and that little bit of help to make sure everything turns out right after you have clicked that shutter. A tool worth having in your camera bag.